White-footed mice are efficient transmitters of Lyme disease in the Northeast. They infect up to 95 percent of the ticks that feed on them. But it's people who create the conditions for Lyme outbreaks by building homes in the animals' habitat. 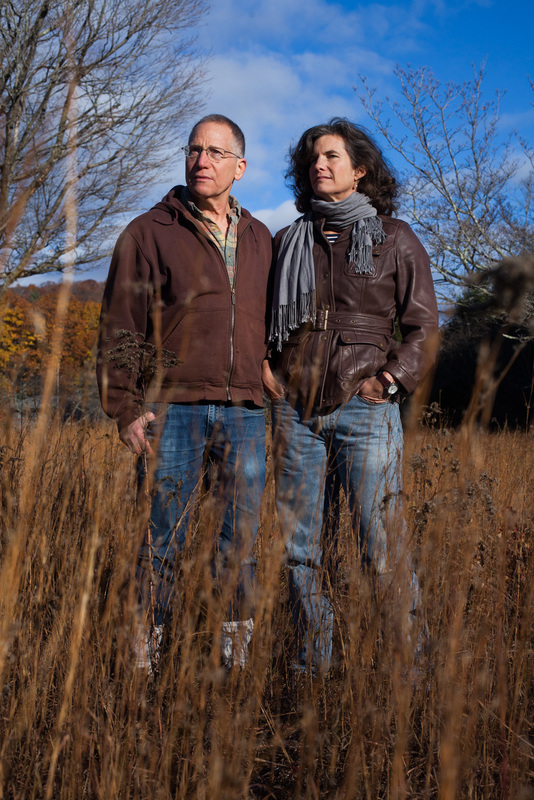 Rick Ostfeld and Felicia Keesing have been studying Lyme disease and ways to stop it for more than 20 years. The couple has come up with a way to predict how bad a Lyme season will be a full year in advance. Keesing and Ostfeld, who have studied Lyme for more than 20 years, have come up with an early warning system for the disease. They can predict how many cases there will be a year in advance by looking at one key measurement: Count the mice the year before. The number of critters scampering around the forest in the summer correlates to the Lyme cases the following summer, they've reported. The explanation is simple: Mice are highly efficient transmitters of Lyme. They infect up to 95 percent of ticks that feed on them. 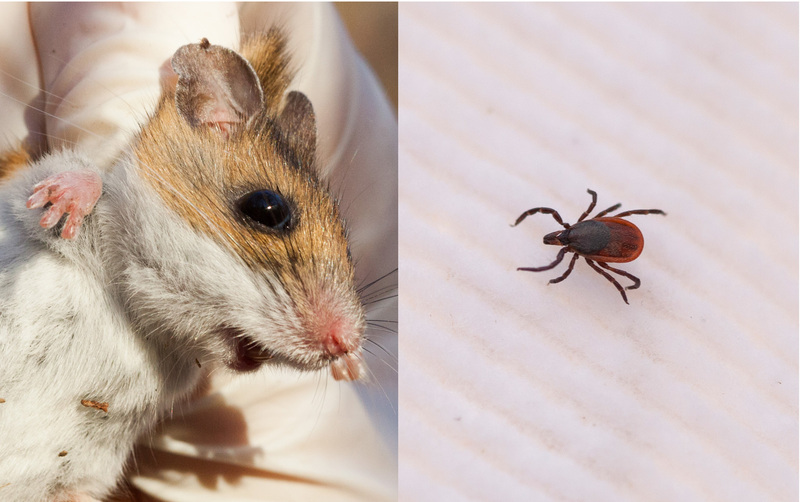 Mice are responsible for infecting the majority of ticks carrying Lyme in the Northeast. And ticks love mice. "An individual mouse might have 50, 60, even 100 ticks covering its ears and face," Ostfeld says. So that mouse plague last year means there is going to be a Lyme plague this year. "Yep. I'm sorry to say that's the scenario we're expecting," Ostfeld says. Mice and ticks get along swimmingly. Other animals, such as possums, groom away ticks — and sometimes kill them. But white-footed mice tolerate ticks covering their faces and ears. Blacklegged ticks, like the adult female on the right, are tiny — about the size of a sesame seed. He's not exactly sure which parts of the Northeast will be at highest risk. But wherever Lyme exists, people should be vigilant, says epidemiologist Kiersten Kugeler at the Centers for Disease Control and Prevention. "Whether it's a bad season or not, there's still going to be a lot of human cases of tick-borne diseases," she says. "What's important for people to know is that the ticks are spreading to new areas — and tick-borne diseases are coming with them." Back in the early '80s, the disease wasn't that big a problem. Cases were confined to two small regions: western Wisconsin and the area from Connecticut to New Jersey. Since then, Lyme cases have shot up in number and spread in all directions: "The only place that they haven't really spread is into the Great Lakes and the Atlantic Ocean, for obvious reasons," says biologist Rebecca Eisen, who's also at the CDC. Now Lyme is present in more than 260 counties, the CDC reported in 2015. The disease shows up in Maine, swoops down the East Coast into Washington, D.C., and southern Virginia. Then it hops to the Midwest into northern Indiana, Illinois, Wisconsin and Minnesota. There are also small pockets of Lyme on the West Coast. Since the early '90s, reported cases of Lyme disease have tripled, to about 30,000 cases each year. The CDC thinks the actual number is 10 times higher. "We think the true burden of Lyme disease in the U.S. is about 300,000 cases," Kugeler says. "Lyme disease is quite a big public health problem." The reasons for this Lyme explosion are many, Ostfeld says. Climate change is part of it. The surge in deer — which feed ticks and spread them around — has also been a factor. But Ostfeld has found another reason, something that happened more than 200 years ago. Today the Hudson River Valley in upstate New York is gorgeous. The hills are covered with oak forests, and the valleys are patchworks of hayfields and farms. But Ostfeld says the area didn't always look like this. When the Europeans came here hundreds of years ago, they clear-cut nearly all of the forests to plant crops and raise livestock. "They also cut down trees for commercial use," Ostfeld says, "to make masts for ships, and for firewood." Since then a lot of the forest has come back — but it's not the same forest as before, he says. Today it's all broken up into little pieces, with roads, farms and housing developments. For mice, this has been great news. "They tend to thrive in these degraded, fragmented landscapes," Ostfeld says, because their predators need big forests to survive. Without as many foxes, hawks and owls to eat them, mice crank out babies. And we end up with forests packed with mice — mice that are chronically infected with Lyme and covered with ticks. So all these little patches of forest dotting the Northeast have basically turned into Lyme factories, spilling over with infected ticks. Then people come along and do the darndest thing, Keesing says: They build their dream homes right next door. "So we see that humans are putting themselves in these areas where they're most at risk," she says. To figure out why Lyme has become more prevalent, researchers at the Cary Institute of Ecosystem Studies in Millbrook, N.Y., have trapped hundreds of thousands of rodents in the woods over the past 20 years. Research assistant Francesca Rubino checks a squirrel for ticks. And that means people, in some areas, may be putting themselves at risk for Lyme every single day without even knowing it, says the CDC's Kiersten Kugeler. "In the Northeast, most people catch Lyme around their homes," she says. "People out gardening. People playing in their backyard. Mowing the lawn." So what can you do to keep from getting infected? Add a tick check to your daily routine, Kugeler says. When you're in the shower check your body for tiny ticks, especially the places they like to hide. "That's the scalp, behind the ears, the armpits and in the groin area," she says. If you do find a tick, get it off as quickly as possible. The longer an infected tick stays on your skin, the greater the chance it will pass the Lyme bacteria on to you. Generally, it takes about 24 hours for the tick to infect a person after it starts biting. Then be on the lookout for Lyme symptoms — like a red rash or a fever. It anything crops up, go see a doctor immediately. Don't wait: The earlier you get treated, the better chance you'll have for a full recovery. We have an early warning in Your Health this morning. Ecologists are expecting a really bad season for Lyme disease. Their warning applies to parts of the Northeast this spring and summer. NPR's Michaeleen Doucleff reports on the really gross reason the ecologists expect a bad season. MICHAELEEN DOUCLEFF, BYLINE: When Felicia Keesing returned home from a trip last summer, she found her home in upstate New York had been subject to an invasion. FELICIA KEESING: There was evidence of mice everywhere. They had just completely taken it over. DOUCLEFF: It was a plague of mice, an infestation. And it landed right in Keesing's kitchen. Her husband, Rick Ostfeld, says there weren't just signs the mice had been there. There were actual bodies. RICK OSTFELD: Dead mice on the floor. KEESING: You cannot start this story this way. KEESING: This is disgusting. I still have nightmares about the mouse plague. OSTFELD: Yeah. That was bad. DOUCLEFF: The whole Hudson River Valley was experiencing a mass infestation last summer. The critters were everywhere. For most people, it was just a nuisance. But for Keesing and Ostfeld, it signaled something foreboding. You see, they're both ecologists who've studied Lyme disease for 20 years at Bard College in the Cary Institute. Lyme is transmitted by ticks. And they've discovered that a mouse plague in the summer means a Lyme plague the following year because ticks love mice. OSTFELD: An individual mouse might have 50, 60, a hundred ticks covering its ears and the rest of its face. DOUCLEFF: So seeing all these mice means that there's going to be a lot of Lyme disease cases? OSTFELD: Yeah. I'm sorry to say, that's the scenario we're expecting. 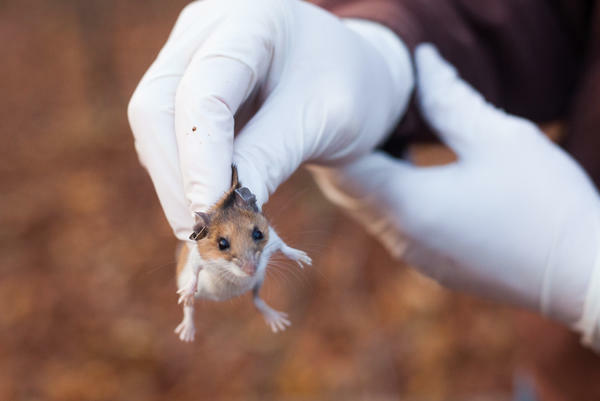 DOUCLEFF: While Keesing and Ostfeld were noticing the mouse invasion, across the country in Colorado, two other scientists were noticing another worrying trend. They work at the Centers for Disease Control and Prevention. One of them is Kiersten Kugeler. She says a few decades ago, Lyme disease wasn't that common. KIERSTEN KUGELER: Back in the early '90s, about 10,000 cases of Lyme disease were reported each year in the U.S.
DOUCLEFF: Today, it's much, much worse. KUGELER: We think that the true burden of Lyme disease in the U.S. is about 300,000 cases each year. DOUCLEFF: Wow. That's a lot, isn't it? KUGELER: It is a lot. Lyme disease is quite a big public health problem. DOUCLEFF: Here's how Lyme disease happens. Mice and some other small creatures carry around this little bacteria shaped like a fusilli pasta. The mouse passes the bacteria onto a tick, which then passes the bacteria onto a person when it bites. Lyme causes a fever, headache, arthritis and sometimes a red rash. In bad cases, it can damage the heart. Back in the '80s, Lyme cases were confined to two small areas - southern New England and western Wisconsin. Rebecca Eisen, also at the CDC, says now cases are spreading in all directions. REBECCA EISEN: They've spread to the North, the Southeast and the West. The only place that they haven't spread is into the Great Lakes and the Atlantic. DOUCLEFF: Today, Lyme is common in a big swath of the country. It starts up in Maine, swoops down the East Coast into Virginia, hops to the Midwest into Illinois, Wisconsin and Minnesota. And then there are pockets on the West Coast. EISEN: A lot of people are seeing ticks in places where they didn't see them 20 years ago. DOUCLEFF: So why is Lyme spreading like this? That question is simple, but the answer is complicated. Scientists say climate change might be part of it, as well as the explosion of deer, which carry ticks and spread them around. But Ostfeld has found another reason, something that happened 200 years ago. He takes me into the forest near his lab in upstate New York to show me what he means. OSTFELD: It's a bit of a walk. It's not very far. DOUCLEFF: OK. We're going to hike in. We're in the heart of the Hudson River Valley. And it's gorgeous. The hills are covered with oaks. And the valley is a patchwork of hayfields. But Ostfeld says this area didn't always look like this. When the Europeans came here hundreds of years ago, they cut down nearly all of the forest to plant their crops, feed their animals. OSTFELD: They also cut down trees for various kinds of commerce, making masts for ships, for building, for firewood. DOUCLEFF: Since then, a lot of the forest has come back. But it's not the same. It's not one big forest. It's broken up into little pieces, fragmented with roads, farms and housing developments. For mice, this has been great news. OSTFELD: They tend to thrive in these degraded, fragmented landscapes. OSTFELD: That's a holiday for the mice. DOUCLEFF: They crank out babies like nobody's business. And we end up with these forests packed with mice, mice that are chronically infected with Lyme and covered in ticks. OSTFELD: So the mice reach very high abundance in little one-acre wood lots in the middle of suburbia. And as go the mice, so go the infected ticks. DOUCLEFF: And so goes the Lyme disease. DOUCLEFF: So all these little patches of forest dotting the Northeast have turned into Lyme factories. And people come along, Keesing says, and build their dream homes right next door. KEESING: Humans are putting themselves in these areas where they're, in a sense, most at risk. And then they're modifying the environment to make it - that - it even riskier. DOUCLEFF: That means people aren't just at risk when they're camping or hiking. The CDC's Kiersten Kugeler says most people catch Lyme disease just hanging out around their homes. KUGELER: People out gardening, people playing in their backyard, mowing the lawn. People may be putting themselves at risk every single day without even knowing it. DOUCLEFF: So what can you do to keep from getting infected? Kugeler says a good thing to do is to add a tick check to your daily routine. Now, these animals are tiny, about the size of a poppy seed. So when you're in the shower, check your body for tiny ticks, especially the places they like to hide. KUGELER: That's the scalp, behind the ears, the armpits and in the groin area. DOUCLEFF: If you do find a tick, get it off as quickly as possible. The longer the tick stays on your skin, the higher the chance it will inject the Lyme bacteria into your blood. Next, be on the lookout for symptoms like a rash or a fever. If anything crops up, go see a doctor immediately. Don't wait. The earlier you get treated, the better chance you have for a full recovery. Michaeleen Doucleff, NPR News. (SOUNDBITE OF BEASTIE BOYS' "B FOR MY NAME") Transcript provided by NPR, Copyright NPR. A Yale anthropologist and dozens of other researchers from around the world warn that about 60 percent of earth's primates are at risk of extinction. It's dire news for our closest biological relatives. Conservation biologists say that the good news for wildlife is there are still extensive tracts of forest habitat in the northeast. Yet as humans have built up roads and housing developments, crossing between key habitat areas — such as from the Adirondacks to the Green Mountains — can be a dangerous trip for a moose or a bear. Animal rights have come a long way over the last century, providing, of course, we're not talking about fish. While other vertebrates have slowly been recognized as social, feeling, even sentient beings, fish remain good for three things: owning, catching and eating.